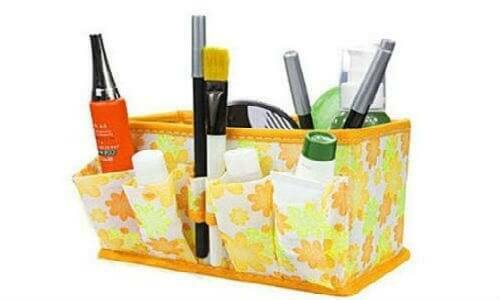 to store your makeup and nail polish in an organized fashion for easy access. Measure the bottom of the cookie sheet and cut the craft paper accordingly. Next, take the hot glue gun and paste it to the edges of the cookie sheet. Place the craft paper delicately and stick it to the cookie sheet. Now take the hot glue and paste it on the magnets. Spread the glue well and stick it to your make up containers. You can easily place it on glass containers, containing face powder or concealer. In order to place your brushes in an organized manner, you can either use a jar or pouches you might find at home and stick them to the cookie sheet in a similar fashion. This way you can easily reach and later place your makeup back on the cookie sheet without ever having to dig through your drawer and leaving it in a disorganized manner. using a wooden spice rack. You can spray paint it to a fun color you want and Voila! -You have a nail polish organizer and storage unit in a few minutes.